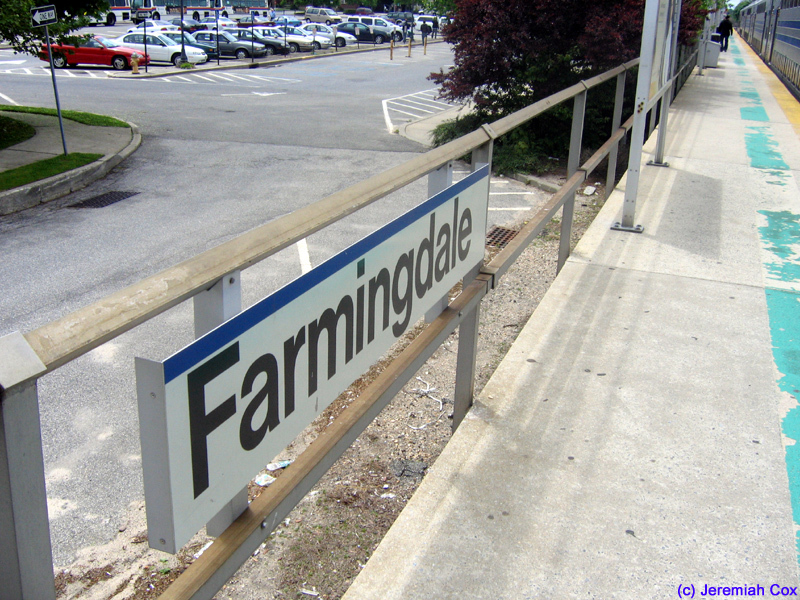 Farmingdale is the last station on the Ronkonkoma Line where it is fully two tracks before becoming one track with two passing sidings around stations for the final 18 miles from a bit beyond this station to Ronkonkoma. 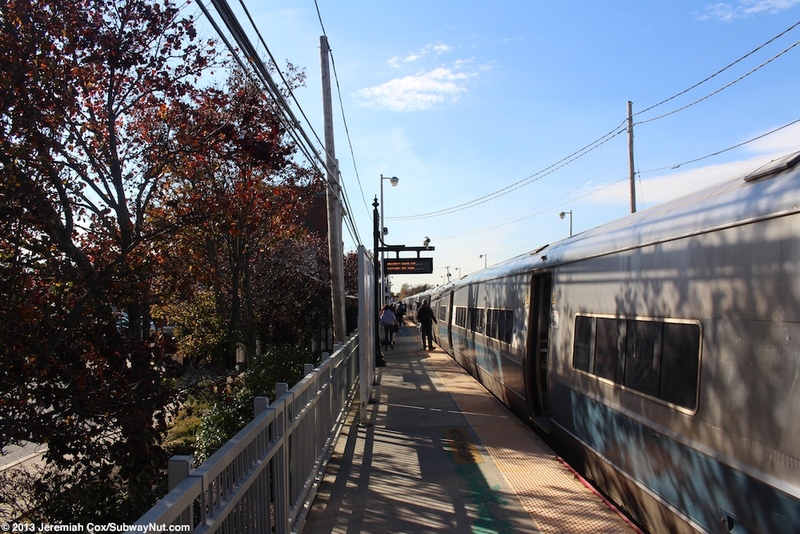 The ROW is wide enough for a second track (with no property acquisitions) and the first phase of building this track is about to receive a design/build contract and will be completed in two phases by 2018. 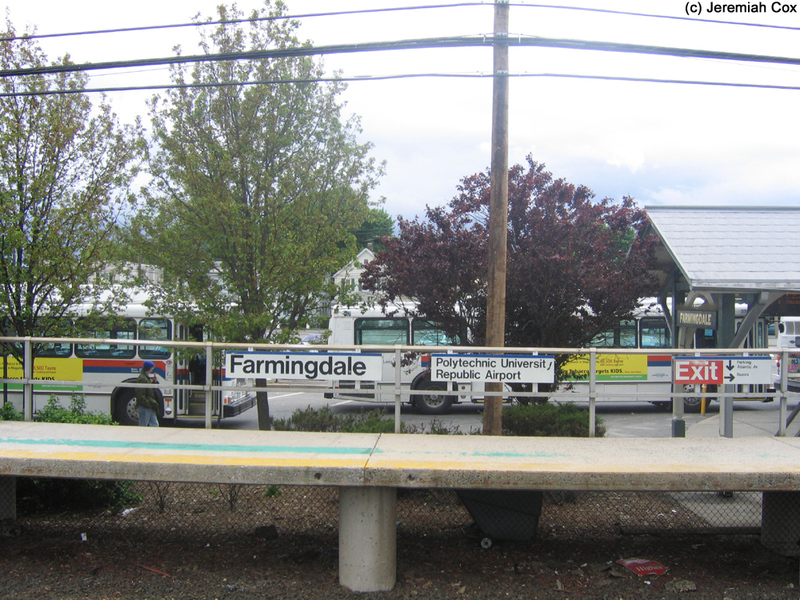 The single-track characteristic of the line beyond Farmingdale means Farmingdale station receives service basically hourly or better throughout the day but there are large gaps in reverse commute service with no Ronkonkoma-bound trains leaving Farmingdale for Ronkonkoma between 6:04am and 8:35am and no Penn Station-bound trains originating in Ronkonkoma from 4:48pm and 7:13pm. 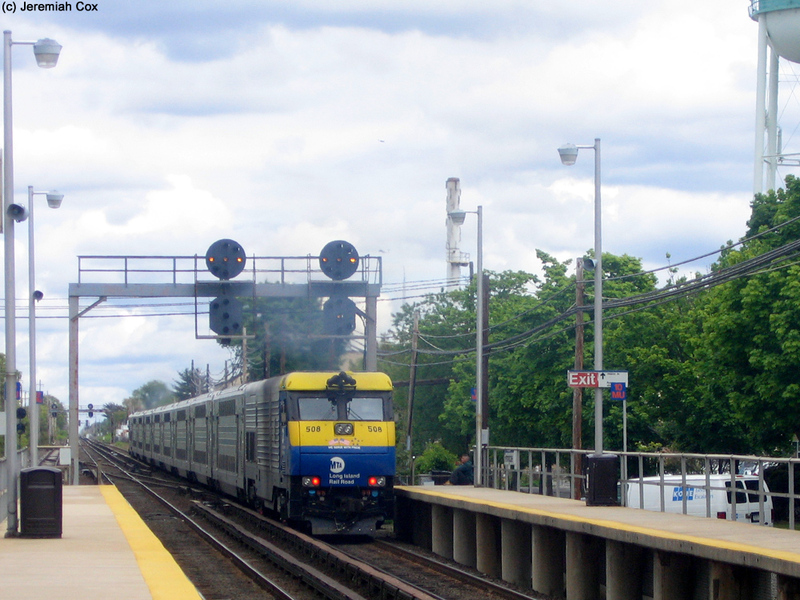 There is though just one reverse peak train that originates in Farmingdale during these two gaps of service. 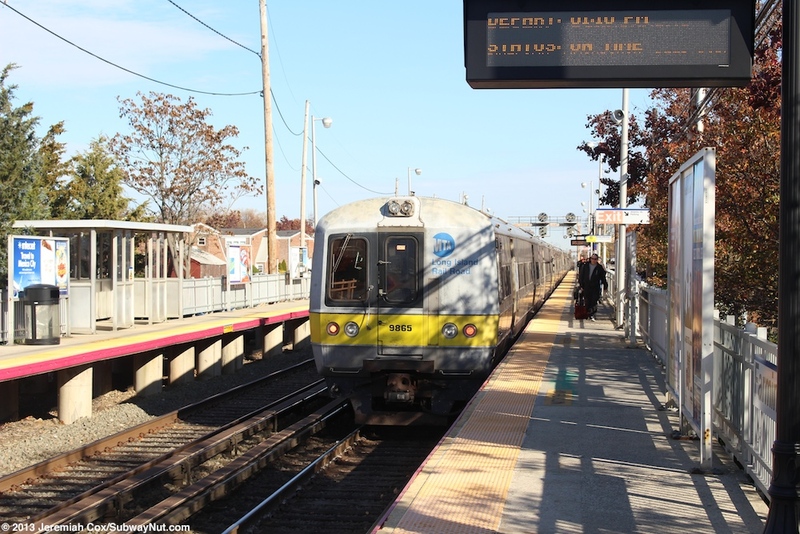 The station is the terminus and originating point of a few more trains as well. 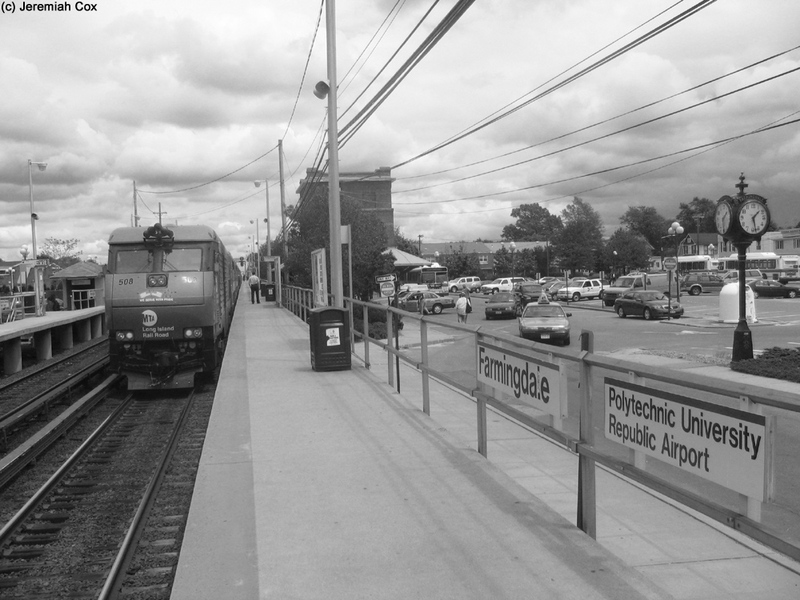 The station has two 12-car side platforms that were built with electrification in the mid-1980s. 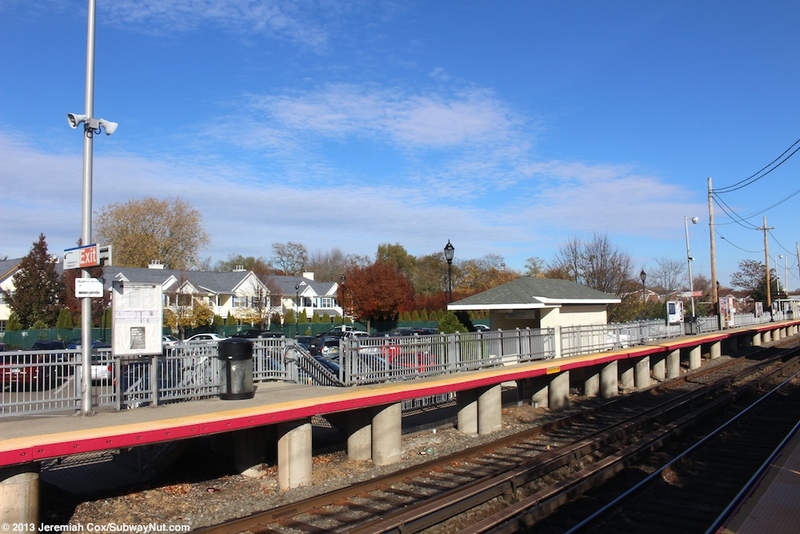 These platforms begin at the grade crossing of Secatogue Avenue and run east, the Secatogue end of the platforms up from the grade crossing is where each has its wheelchair ramp. 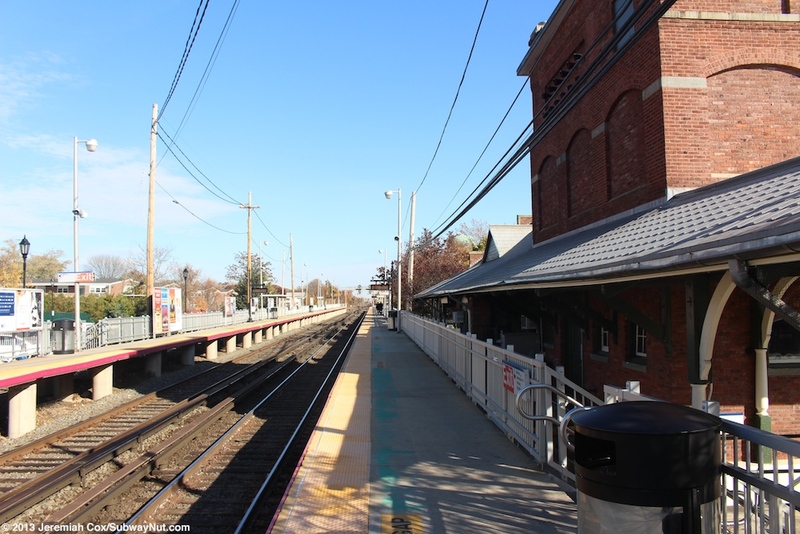 Along the Ronkonkoma-bound platform is the station's historic 1896 (and on the US register of historic places) station house. 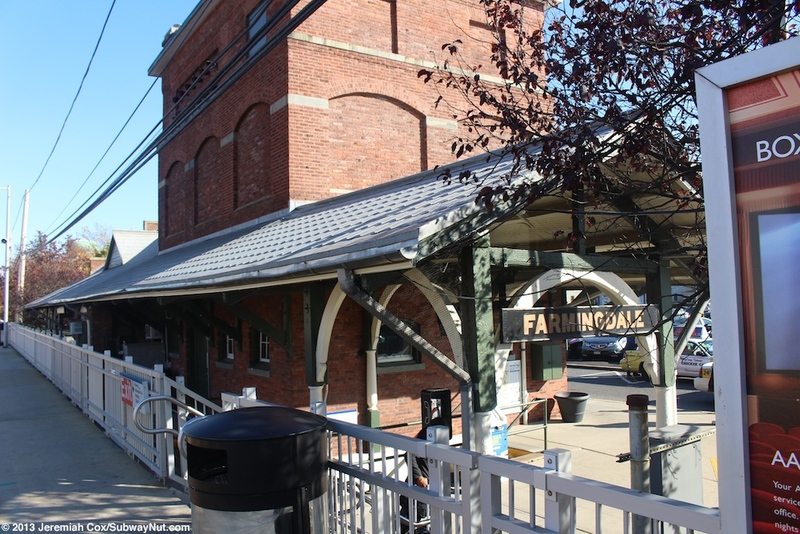 The large brick depot is dominated by a brick tower rising above it that was added in 1909 to be the substation for the Amityville to Huntington Trolley Line (that only operated until 1919). 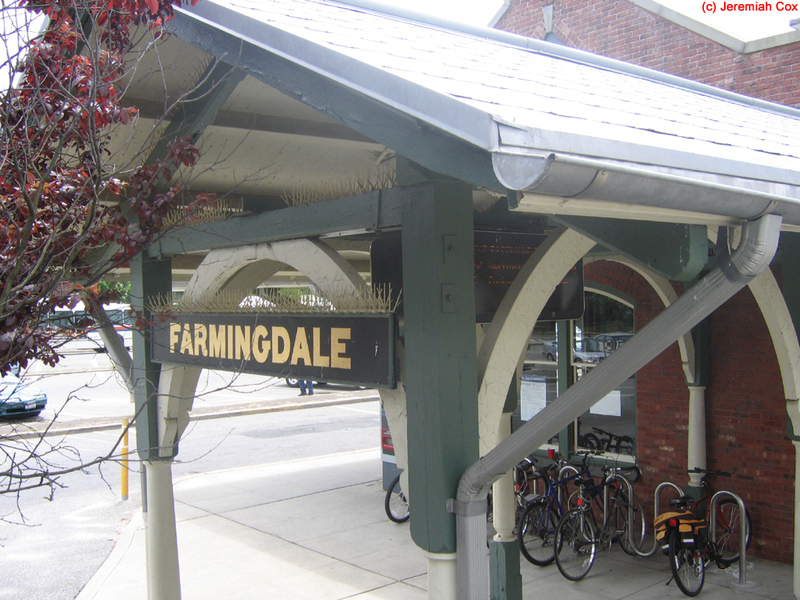 A wide gabled awning roof surrounds the station with a bit of a porch on each side that extends a short distance from each side of the building. 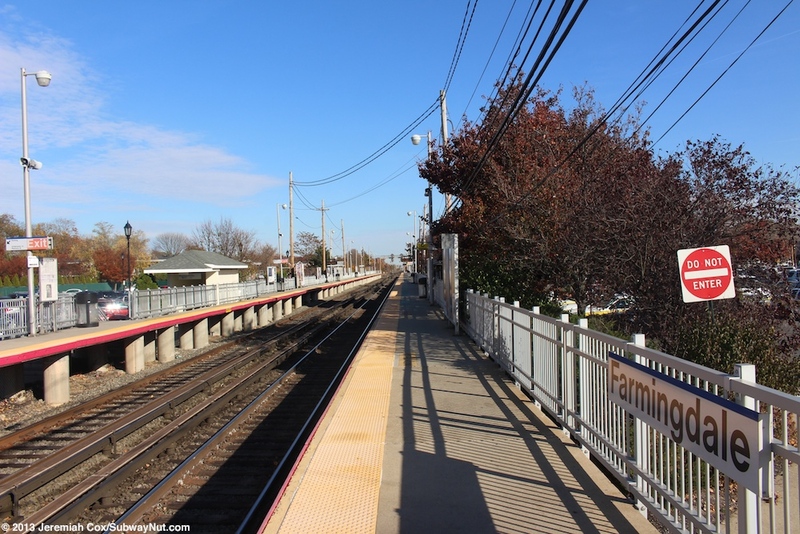 The station is at street level so the platform gets a bit narrower by the building. In the eastern wing of the station is a waiting room and former ticket office. This room was rebuilt at some point and has non-historic light blue tiled walls and an acoustic tile and florescent lighting ceiling. The windows and doors and the remains of the ticket window have historical looking maroon trim. Benches are wooden subway-style ones. The waiting room is open all day 6:00am to 10:00pm weekdays, until 8:00pm on weekends. 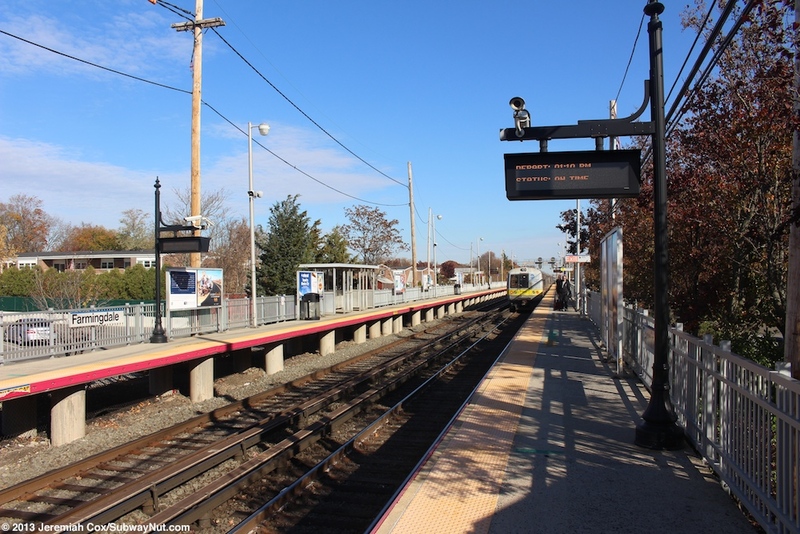 The entire Ronkonkoma-bound platform is along Atlantic Avenue with staircases down at regular intervals to this street. 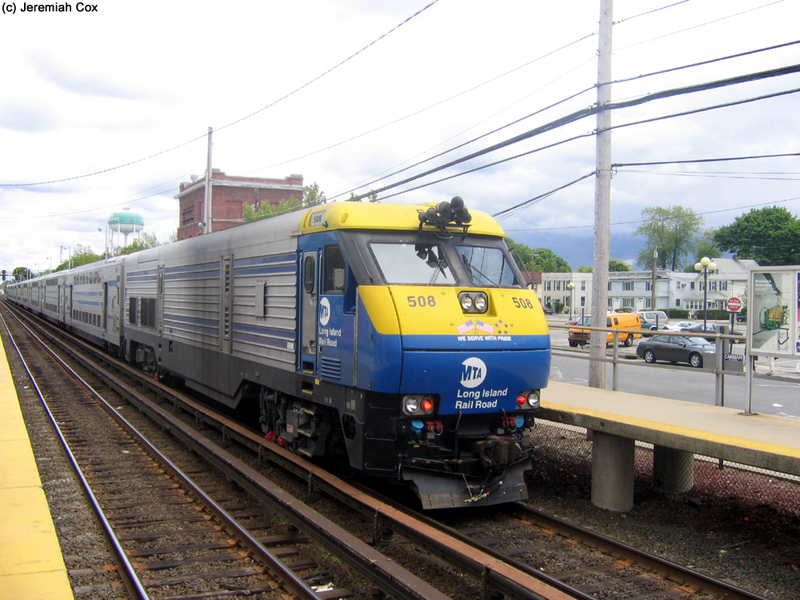 A parking lot is behind the depot. 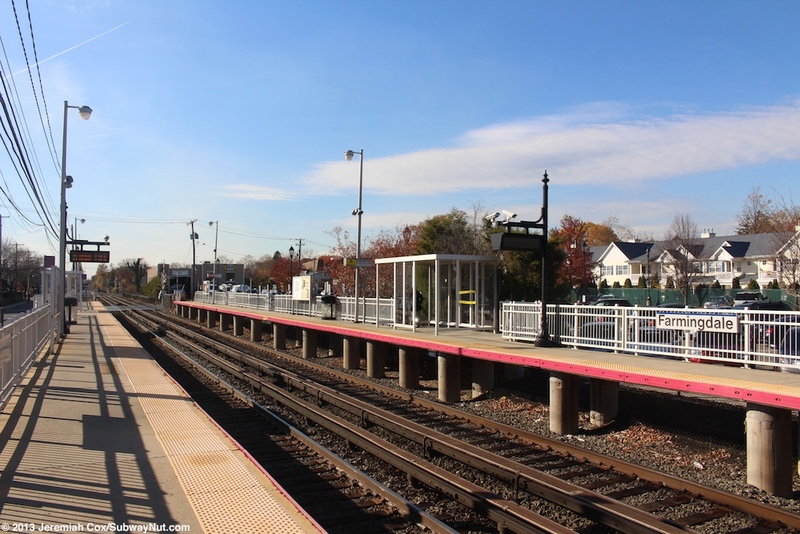 On the east side of the depot are two staircases (one arrives closer to the platform, the other into the parking lot) that lead down to an underground pedestrian tunnel. 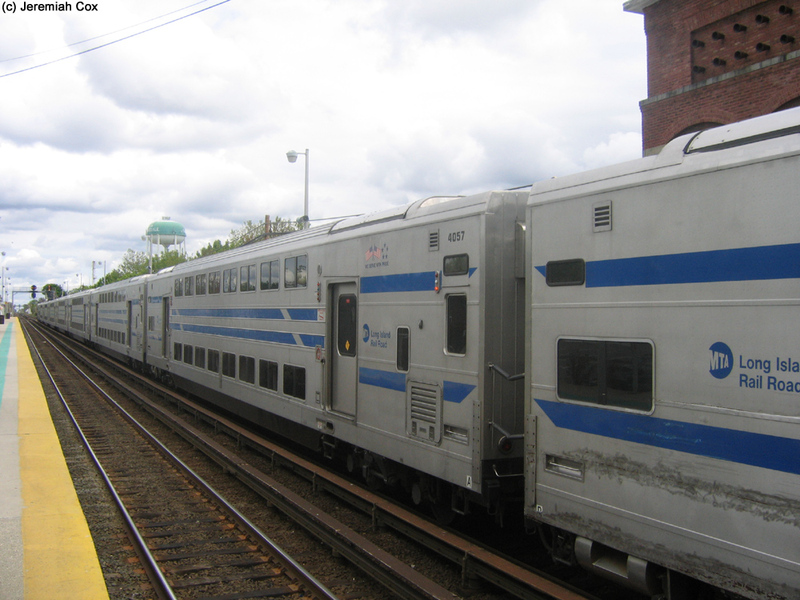 This tunnel has generic cream-colored walls and leads up to a generic portal with a small gabled roof at street-level along the City-bound platform. 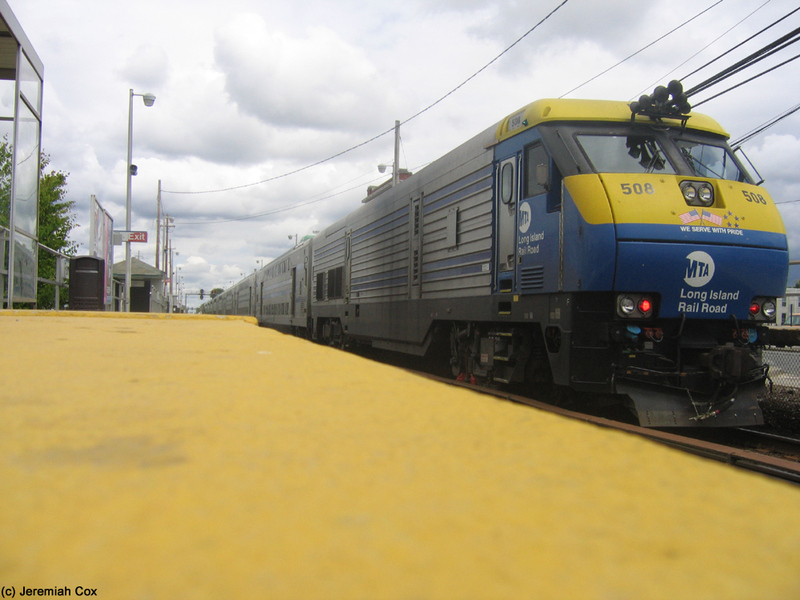 The City-bound platform is along a smaller parking lot for about half its length with a number of staircases, the eastern end has no further access with a freight track opposite the platform. 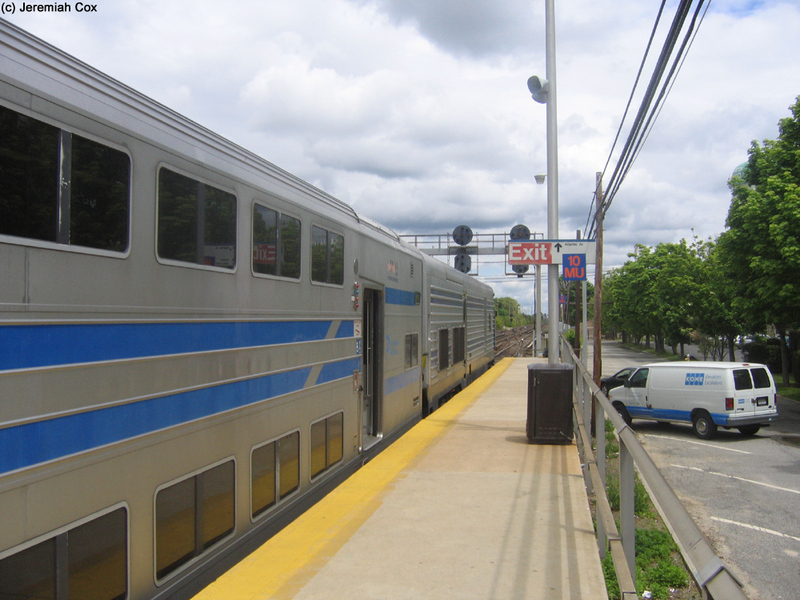 The only amenities for waiting passengers on the platforms themselves are a few shelters, some are the normal silver design, others are white. 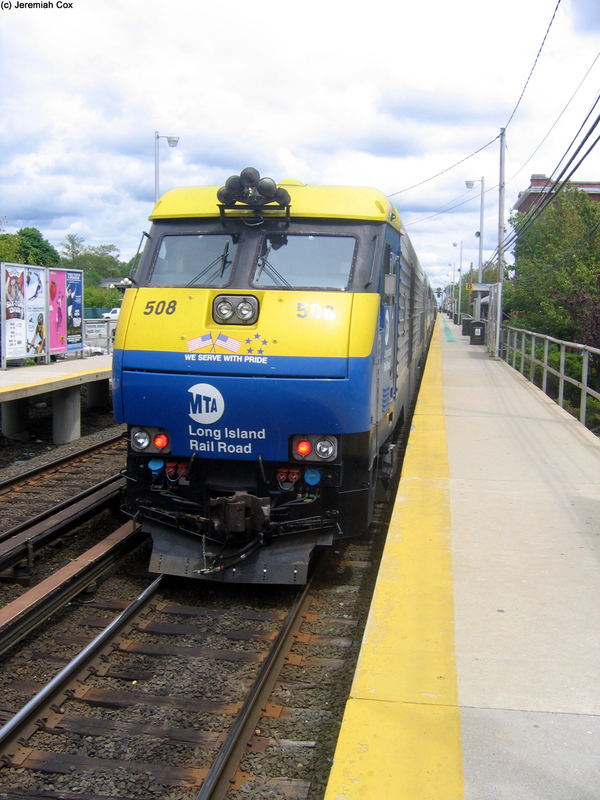 There is one near the ramp entrance to the Ronkonkoma-bound platform and two on the New York-bound platform. 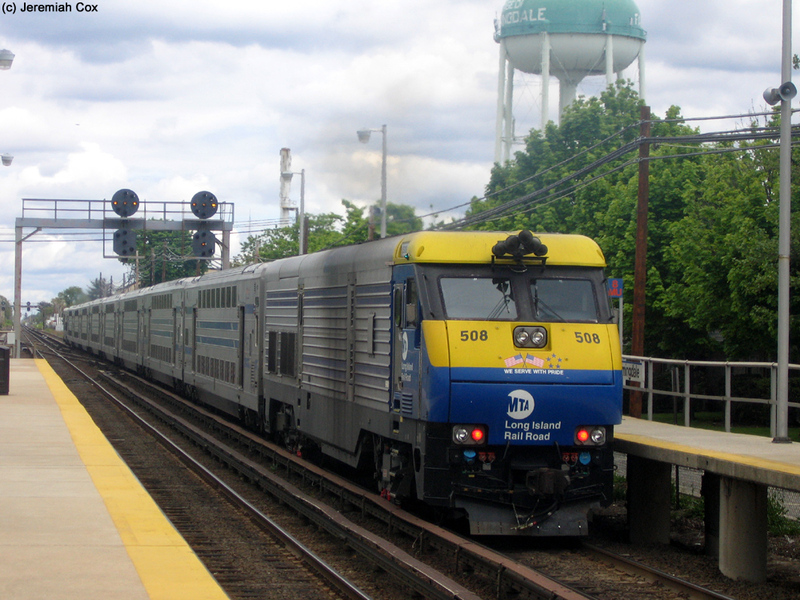 A train of Bi-level C-3s (#4036 & DM-30 Dual-Mode Locomotive #519), makes a rare appearence at Farmingdale, its here because of construction which made Ronkonkoma line trains run via Babylon. 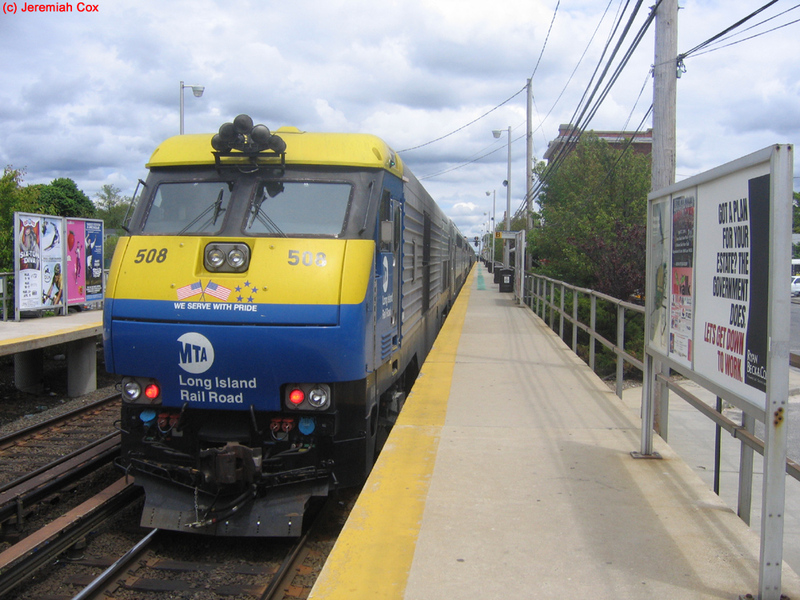 DM-30 Dual-Locomotive #4036, bound for Ronkonkoma, running instead of electric service because of construction waits at Farmingdale for its scheduled departure time.